You are here: Home / Healthy Living / Beware of GMO Potatoes! The first-generation genetically engineered (GE) Innate® potato, developed by J.R. Simplot and branded simply as White Russet™, was approved by the U.S. Department of Agriculture (USDA) in 2014 and entered the U.S. marketplace in 2015. It is now widespread in the US food supply. 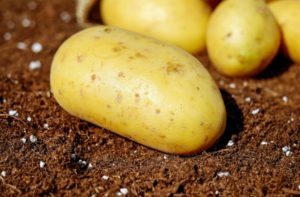 The Innate® potato was created using RNA interference (RNAi) technology to inhibit blackspot bruising and browning by reducing levels of asparagine and certain enzymes in the potato. This allows food manufacturers to prepare raw potato products at a separate facility without browning effects. The GE reduction in asparagine reduces the risk of ingesting the probable carcinogen acrylamide which is produced when potatoes are heated at high temps. Potatoes produce melanin (which turns them brown) when bruised in order to protect the tuber in areas where cells are damaged. Browning is also nature’s most visible way of letting you know that a product is rotting. Genetic engineer Caius Rommens, former director of research and development at J.R. Simplot Co. and a former team leader at Monsanto, has written a tell-all book about the GE potatoes. In his book, “Pandora’s Potatoes: The Worst GMOs,” Rommens reveals the GE potatoes contain unstable traits and unintended mutations that compromise nutrition, noting they are likely to contain constituents that may be harmful to human health.